Monster Media Announces Settlement in its Social Media Out-of-Home Patent Infringement Dispute with Aerva Inc.
Interactive design agency Monster Media developed this animated storefront display to promote the launch of Puma’s PwrCool thermo-regulating athletic gear. The interactive video wall consisted of nine 46-inch digital displays linked together to provide a life-size story of the technology’s development. The nonprofits competing in the second Google Impact Challenge have some pretty innovative ideas for how to make the Bay Area a better place to live. And Google’s method of soliciting votes for the contest is pretty cutting edge, too. 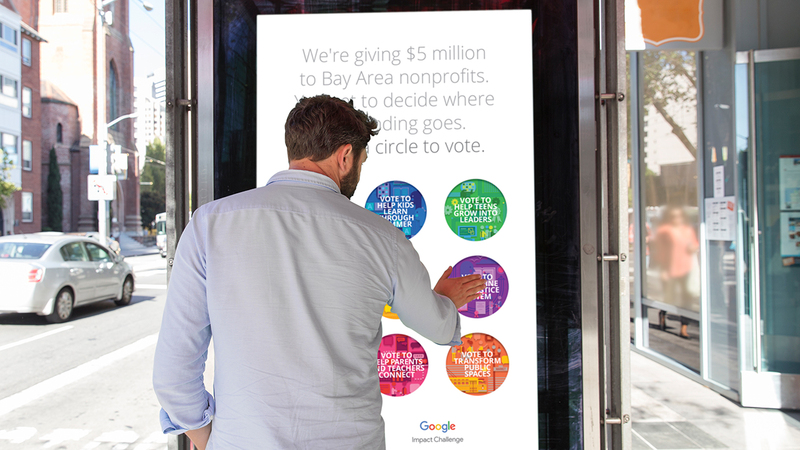 72andSunny created “digital paper” posters that people could press to make real-time votes in over 15 neighborhood spots, including restaurants, coffee shops, bus-station shelters and food trucks. The idea was to get as many community votes as possible, and actually getting out into the community accomplishes that much better than only doing an online vote. 72andSunny tapped Monster Media to provide the development for the interactive bus-station shelters. Read full story here. Beginning July 20, coffee drinkers, shopaholics and mall walkers spotted an informative new feature inside The Empire Mall in Sioux Falls. The “Hungry for Truth” initiative debuted an interactive wall to engage shoppers with healthful recipes, food facts and profiles of farm families in the state. Much like interactive displays commonly found in airports, the “Hungry for Truth” wall is touch activated. The 11-foot by 8-foot wall just inside the main mall entrance near Caribou Coffee features interactive plates of food dishes on the screen with recipes that mall goers can send to their mobile phones. The display will run through the end of the year, and shoppers will have a chance to check back frequently as “Hungry for Truth” reveals new seasonal recipes throughout the remainder of the year. Each of the six plates on the display shares a fact about farming and farmers in South Dakota, giving consumers more information about the food they eat. Visitors will be able to flip over the interactive plates to learn food and farming facts, such as that 98 percent of all farms in South Dakota are family owned and operated. The display incorporates the distinctive look and feel of the “Hungry for Truth” initiative with visual references to the kitchen table where most family conversations about food and farming take place. One of the goals of the initiative – launched in early 2015 – is to “put everything on the table” when it comes to open, honest discussions between South Dakotans and farmers. The interactive wall was created exclusively for the “Hungry for Truth” initiative by Monster Media, an international company specializing in digital and interactive displays. Monster Media has developed thousands of interactive campaigns internationally for clients including the Academy Awards, Blackberry, Chevrolet, Coca-Cola, ESPN, General Electric, IBM, Reebok, Target, and many more. “Hungry for Truth” leaders began working with the Monster Media team in May to develop the display at The Empire Mall. While visiting the display, shoppers also have the chance to enter a giveaway to win a $25,000 kitchen makeover. Visit HungryForTruthSD.com to find out more on how farmers are putting everything on the table and sharing their stories about raising healthy and sustainable food. A tech hub in downtown Orlando has a new social media-friendly addition. The Exchange Building, which is home to tech coworking space Canvs and hosts several tech-based events and meetups, unveiled a high-tech wall that can be used to enhance those meetups. The structure, which consists of nine large-screen televisions, by default shows a feed of Twitter posts that mention any of the building’s tenants but it can be repurposed to fit any group’s needs. On Thursday, for example, the wall displayed startup companies’ presentations as they showed off their businesses at a meetup. Monster Media group, an Orlando-based provider of digital advertising platforms, partnered with Echo. The debut came during a monthly meetup hosted by the tech group. The monthly meeting gives attendees a glimpse at tech companies with a presence in Orlando. Augment: A company that has built an augmented reality mobile application that allows users to create 3D models and view them in real time. For instance, the app could overlay a 3D model of a couch on a scene so homeowners can see how new furniture would look in their home. 6PHP: A donation-based crowdfunding platform. iCheckContractors: A service for contractors that can verify licensing, insurance and other details in real-time. My One Resource: An all-in-one organizational tool that logs personal information and other pertinent data for users to access immediately. Effin Amazing: An analytics consulting company based in Orlando.